I love sitcoms. I love that my ADD can wander about the room in search of something shiny and not miss any major plot point when watching. When flipping the channels, I always linger on Seinfeld, Friends, King of Queens and Will & Grace. There's also the phenomenal anti-Cosby Show, Roseanne. The working class comedy with blankets decorating the furniture speaks to me in a special way. 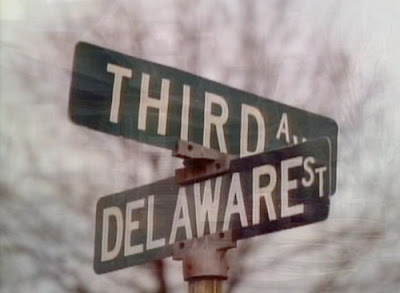 The website, Third and Delaware, chronicles the fashion statements made on this unique 80's/90's sitcom. Generation X will particularly see themselves, even with some regret, in the hilarious choices made by the creative costumers. Every time a new Pixar movie comes out I think "This cannot be as good as Finding Nemo." And even though each film is really superb, they still fall a hair short. Until Up. Any movie where I cry in the first act is likely to be a keeper. Just in case you haven't seen it, Up is the tale of a grumpy old man and an eager wilderness explorer who fly to South America in a floating house suspended from balloons. It received a 98% on Rotten Tomatoes for a reason. Read my "listen" recommendation and then get in the car and go buy it. Where's your coat? If BB King and Stevie Ray Vaughn had a love child - #1 It would be covered by CNN and #2 The picture next to Anderson Cooper's talking head would be of Jonny Lang. I listen to Mr. Lang and always feel like I should have more angst in my life so I can appreciate all of his angst. This song, Lie to Me, is his most downloaded and I'm tightly hugging his new album "Live at the Ryman." Up is an amazing movie. . . and way more real than any cartoon should ever be. . . There was definitely a better way to say that - and I don't care to figure it out. I, being late to watch most movies, just saw UP. I agree, it is a very good movie. As Samantha said, more real than it should have been. My three-year-old didn't really like the first part ... because it was sad. Where most kids that age wonder off until the actions starts ... mine keys in on emotion. So I was a bit worried of just how real it was. Good movie non-the-less. S: This is your prerogative. BJP: I love the fact that Pixar can entertain kids as well as adults. Okay, maybe not emo kids.